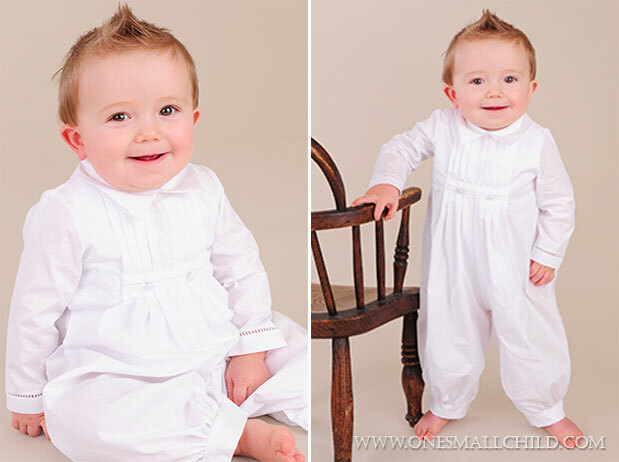 We love our popular Landen Suspender Baptism Outfit so much we couldn’t resist creating a similar style. The One Small Child design team constructs each outfit with baby’s comfort in mind. Although, this time we wanted to combine class with ultimate comfort. Who doesn’t love a day in their pajamas? This question is what inspired our new handsome Payton Suspender Christening Outfit. It gives baby’s that cozy pajama feel, while making them look dashing at the same time. Uber soft cotton rib-knit pants supply ultra pj comfort for your baby boy. Also, giving mom the freedom to snuggle her little one in softness without the stress of wrinkles. A matching rib-knit tie adds an adorable factor. Not only that, but it is removable–oh the convenience! In addition, adjustable baby suspenders are not only “all the rage”, but are positively charming. 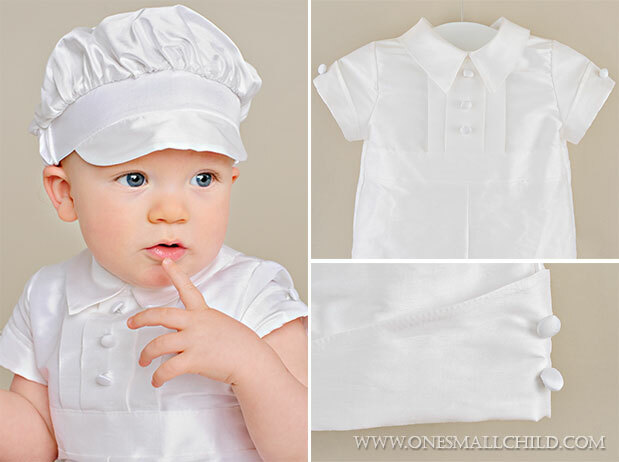 This baptism outfit also includes a crisp “big boy” pointed-collar button up shirt. The best part is, it’s a bodysuit! Three snaps make diaper changing a breeze, and also secures the shirt in place. As a result baby never comes untucked during the big day, no matter who is holding him. Most of all, the baby shirt adjusts for warm and cold seasons. Customers have their choice of a long sleeve shirt, or a short sleeve. Furthermore, the left sleeve cuff can be embroidered with initials to give and overall personal touch! And finally, add the matching newsboy cap for a look no one will be able to resist. It is made from the same rib-knit cotton as the pants and tie. Not only does this foster an impeccable match, it also offers an authentic old-world New York newsboy appeal. Select a custom fit from 2 different sizes: Small (0-9 months) or Large (12-24 months). Introducing Our New Website and New Collection! As you know, at One Small Child, our mission is to help make your occasion special and memorable. We know one of the most important of those occasions is your wedding day. We’ve been inspired to branch out, with the hope of making your big day the best day. 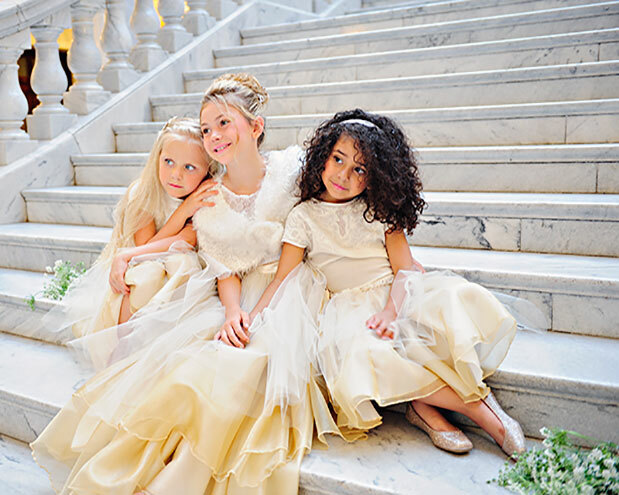 With the new Katy Lane Collection, we now offer a selection of fabulous flower girl clothing. When making the flower girl collection we realized that this could easily translate into a gorgeous women’s line as well. This gorgeous skirt works great as a bridesmaid outfit or for any occasion calling for a special look. 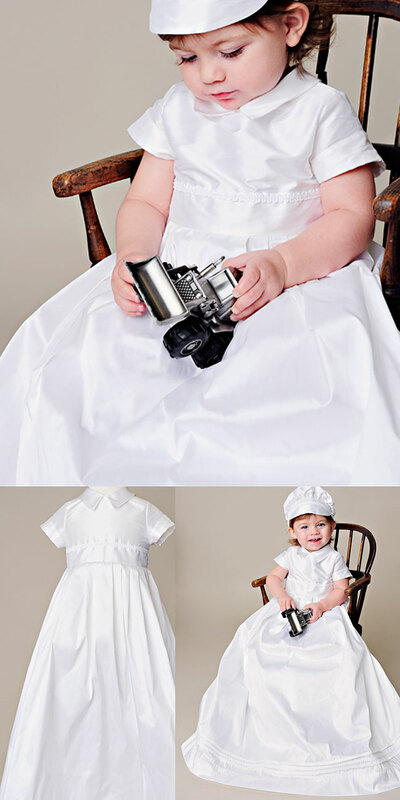 At Katy Lane Collection, we now offer our finest line of designer christening clothing for boys and girls. We’ve taken our decades of experience and poured it into a selection of fine christening wear and complete christening collections. The Katy Lane Collection brings you only the finest textiles and the most intricate detailing in an array of quality, hand-made gowns and outfits with all the matching accessories. Everything in our Katy Lane Collection is hand made in our own U.S.A facility. We make sure that each item sewn on our facility is the best of quality. Your beautiful event is now over. All the guests have now gone, the decorations have been taken down and all those thank you cards are sent. There’s just one more thing on your to-do list: preserving your Christening gown or suit. So, what are the best methods of storage for your precious gown? Are there any preservation tips or tricks? How do you keep your gown looking crisp for siblings or generations to come? Today, we’ll teach you how to preserve and store your Christening gown or outfit the right way. Step 1-Dry clean or hand-wash the baptism gown or blessing outfit as directed on the clothing tag. Why? Stains and body oils can irreparably discolor the fabric. If your item calls for a hand-wash, avoid using harsh soaps, chlorine bleach, fabric softeners, and starch. Rinse the christening dress or outfit well to remove detergent residues. Step 2-Once the gown or outfit is completely dry, stuff it with clean, acid-free tissue; this will help prevent hard creases that can weaken the fabric. Fold additional tissue into pleats and slip it between layers of fabric. 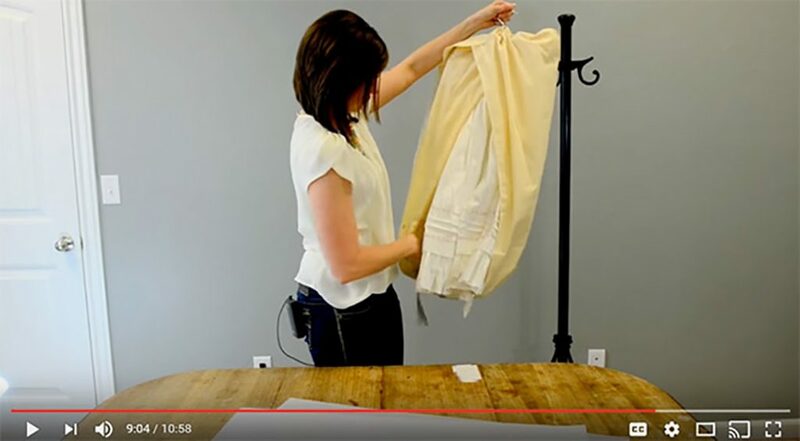 Step 3-Place the christening outfit in a 100 percent cotton muslin garment bag. Plastic or vinyl bags are unacceptable for long-term preservation since garments need to breathe. For this same reason, you should not seal or wrap a cardboard box containing heirloom christening clothing. Never pack mothballs with your christening apparel since they can ruin fabric over time. Also avoid storing the christening suit or gown with metal items. If you have purchased a bracelet for your special occasion, you can find the perfect display frame here. It’s a good idea to label your storage container (if it is not already monogrammed or personalized) with your child’s name and event or birth date. Step 4-Store the christening gown in a dark, cool, dry place (for example, in a closet or under a bed). Avoid storing the box or bag in places where temperature or humidity may fluctuate seasonally (for example, a garage or attic). The ideal storage place has a relative humidity of 55 percent and a temperature of about 70 degrees Fahrenheit. It is a good idea to check your outfit once in a while to ensure that it is maintaining its beauty. 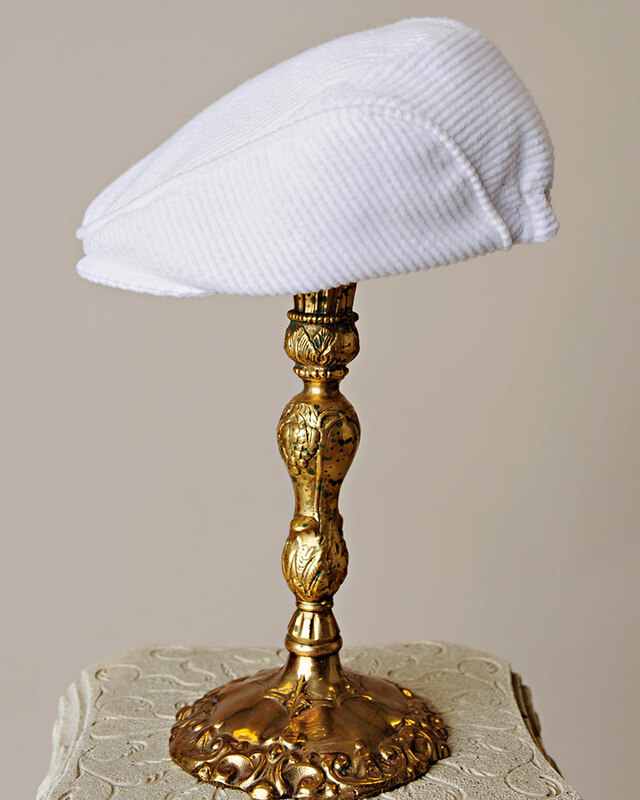 When you handle your christening heirloom, wear cotton gloves–skin oils can discolor fabric. When you wish to use your treasured christening gown or outfit again, remove it from the storage container and air it out for several days. You may need to steam the item to remove wrinkles; iron only as a last resort, and only on a very low setting. That’s all there is to it. 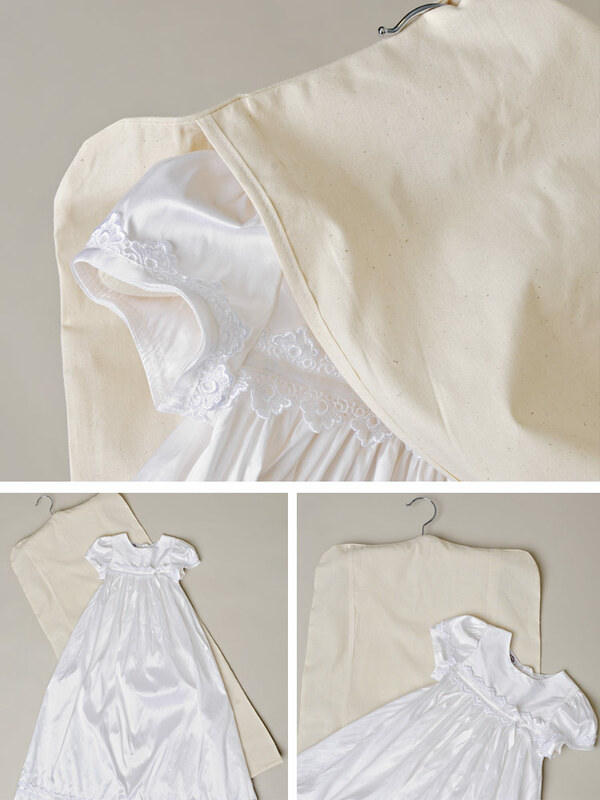 Now you know how to preserve and store your Christening gown or outfit for generations to come! What says ‘little boy’ more than blue and overalls? The Elijah is our newest addition to our blue Christening outfits. We love this colorful version of our classic overall christening outfit-the Johnny. A dressy polyester shantung fabric gives the overalls a sophisticated flair. The soft white cotton bodyshirt ensures comfort for your wee one. He’ll be able to move freely in the short sleeves and legs. Covered buttons accent the overalls and an adorable visor beret hat is the perfect finishing touch. This machine washable outfit is adorable and easy to keep clean. We love these bold blue Christening outfits! Not sure about blue for baby’s main event? The Elijah makes a colorful after-Christening outfit! Summer is in full swing! 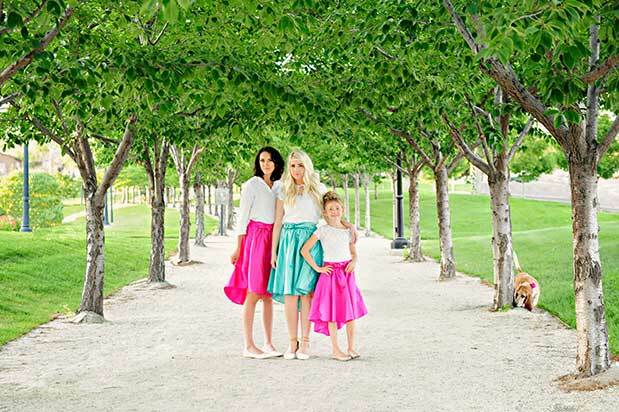 Between swimming, popsicles and bike rides, we’re busy adding some great new summer styles! First up is our fabulous Charles Silk Boys Christening Outfit: Made from 100% silk dupioni, giving it a rich pearl white shade. The robust design features a classic shirt collar, cuffed sleeves, and legs with covered button accents. The lightweight fabric, short sleeves, and legs are perfect for summer weather. 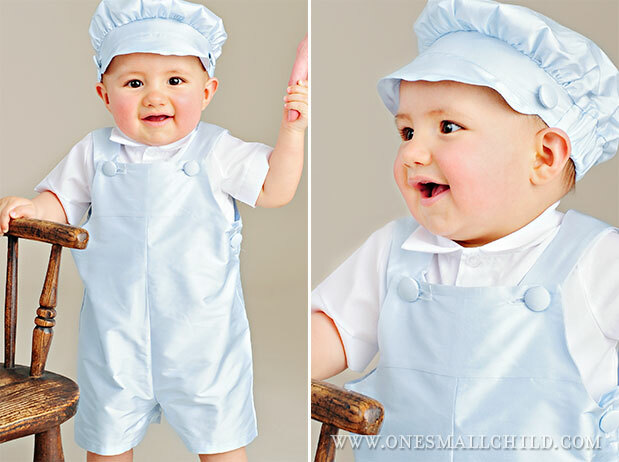 This two-piece set includes the silk boys Christening romper and matching beret style hat. Snag this dignified outfit for your handsome little gentleman this summer! To complete the look we suggest: our Monogram Sleeveless Bodysuit, our Triple Roll Socks, our Silk Booties and our My Christening Day Bib in silk. Looking for a summer Christening outfit that’s both handsome and practical? Our David Boy’s Christening Outfit is just right for those warm sunny days! Made from 100% cotton broadcloth, the David is light-weight and breathable. With short sleeves and legs, this outfit was designed to keep baby cool. Crisp pleats dress the front of the romper for a black-tie look. Button details and entre-deux trim are a masculine finishing touch. With its simple design, the matching visor bonnet is included for your convenience. The bonnet can even be personalized with baby’s name to make it extra special. 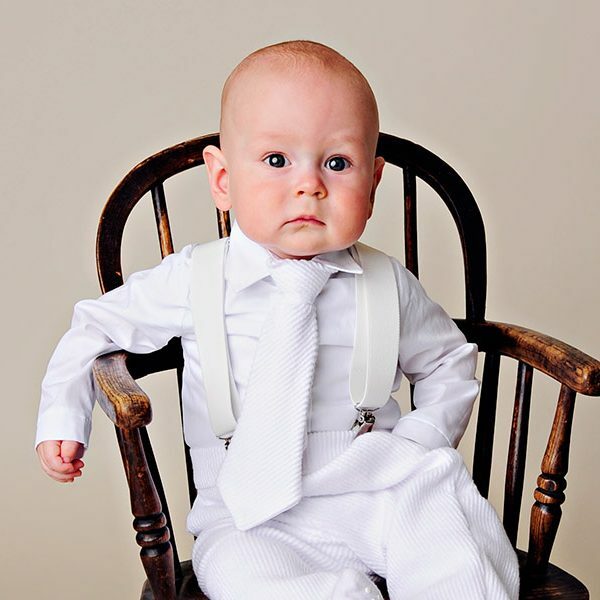 Other customers have given the David Christening Outfit a 5-star rating. Moms love this outfit, and we know you will too! Accessorize the David Christening Outfit with our Triple Roll Socks and Poly-Cotton Oxford Shoes! In need of a fabulous boy’s Christening outfit? Searching for that perfect baptism romper? 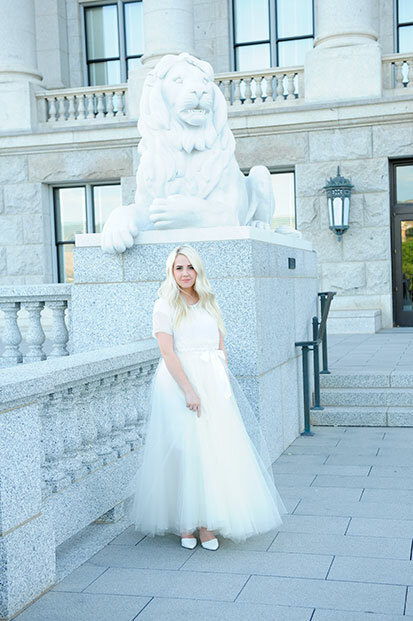 Having trouble choosing an LDS blessing outfit that is just right? We’ve critiqued our boy’s outfits and chosen our top boy outfit for this spring: the Daniel Boy’s Christening Outfit! Let me tell you why. We love the playful pleated design. The entre-deux trim is a very masculine, dressy style. You can personalize this outfit with baby’s name or a crisp cross on the matching visor bonnet (included) to up the keepsake factor. We know how un-predictable spring weather can be, so we’ve chosen a lightweight 100% cotton romper with long sleeves and legs. Whatever the weather, he’ll feel just right in this outfit! With all these features, our customers give the Daniel Christening Outfit a 5-star rating. So, take a look at our top pick for boy’s Christening outfits this spring! Accessorize the Daniel outfit with our sleeveless bodysuit, ribbed ankle socks and our poly-cotton oxford shoes. See more boy’s Christening outfits. 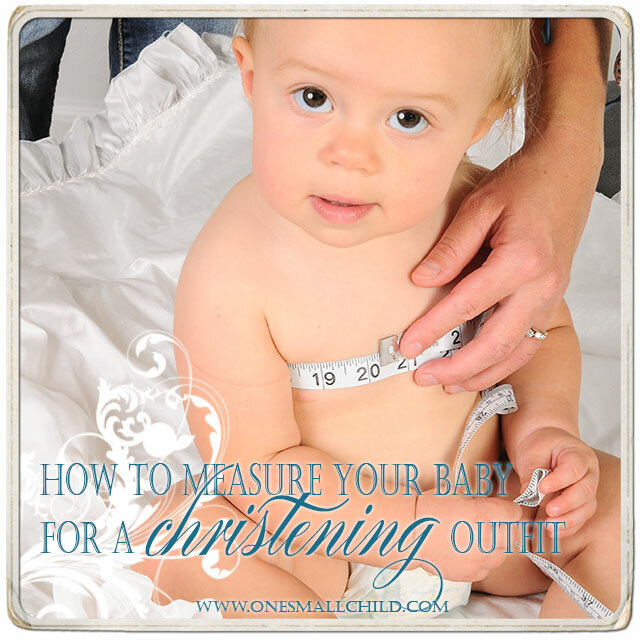 Unsure exactly how to measure your baby for a christening outfit? Here’s a quick demonstration. For more detailed instructions, view this post. One of the most common questions we get is, “What size should I order for my baby?” It’s normal to feel uncertain when trying to gauge exactly what size to select when you don’t have the actual gown or outfit in your hands. Fortunately, we’ve been doing this a long time, and we have a lot of experience in helping you make your decision. Our christening gowns and outfits are sized in a traditional infant size range: Newborn, 3 month, 6 month, 9 month, 12 month, 18 month, and 24 month. These size names can be misleading: it makes sense to think, “If my baby is 6 months old, he’s going to wear a size 6 month outfit.” However, every baby is unique. You may have a thin, petite 9 month-old who perfectly fits a size 6 month gown, or a chubby little cherub who’s rocking size 12 month at the ripe old age of 6 months. For this reason we always encourage our clients to measure their babies and refer to the size charts listed on the ordering page for each of our christening styles. For both christening gowns and outfits, you’ll need a chest measurement. Wrap the tape just below baby’s underarms, and pull it snug (not too tight). Make sure the measurement is as accurate as possible. For christening rompers, you’ll need both the chest measurement and the torso measurement demonstrated below. The torso measurement is the most important metric to guarantee a correct fit. Place the end of the tape at the point where his neck meets his shoulder, and measure down to the bottom of his diaper. It’s a simple process, but can get complicated pretty quick with a squirmy child…it’s okay if you need to take the measurement a couple times to verify accuracy. Once you’ve got your numbers, check them against the size chart for the particular style(s) you’re interested in. All size charts are found on a tab in the lower left-hand corner of the product ordering page. Many of our size charts list a weight range as well as the measurements–this is for reference only, if in doubt, go with the measurements. Once you’ve tackled this job, you’re well on your way to acquiring the perfect outfit for Baby’s special day!